Kenyan coffee has always been very popular with coffee drinkers. Blessed with great terroir and good processing methods, coffees from this country seldom fail to impress. This year however, proved to be a little more challenging to source Kenyan coffees due to the local geopolitical situation that unfolded in the earlier part of the year in the Nyeri region where most good coffee come from within the country. Due to our small buying volumes from Kenya and countries within the continent, we have always depended on our friends from Nordic Approach to find the best of the gems that they can find. These guys does all the hard work on the ground, travelling to the same origin during every harvesting season, sometimes more than once a year to ensure that everything is prepped and ready for the new harvest. 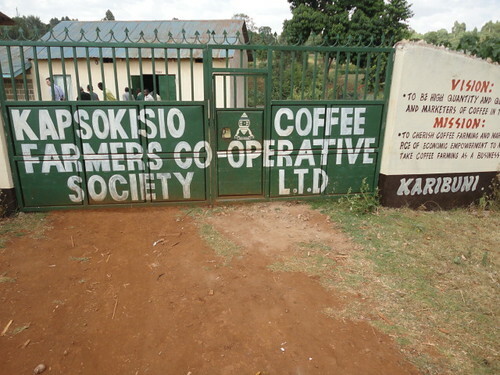 Chorongi is derived from the name of this coffee factory (also known as washing station) which is one of the 7 factories that make up the Mutheka Coffee Farmer’s Society. Smallholder farmers around the factory have an average of 250 coffee trees each, which is really a very small number compared to many other parts of the coffee producing regions in the world. Besides coffee, they also grow maize, bananas and beans to supplement their income. Chorongi is a new addition to our lineup this year. This coffee shines immediately the moment one grinds the beans; the lovely aromatics simply fill the air. The initial taste might remind you of a typical Kenyan profile, but let it cool a little more and you will find the complexity of the layers within. Blackcurrants, rosehip, blackberries and raspberries, rounded up by a superb mouthfeel. Producers: ~ 5600 smallholders in the surrounding areas deliver cherries to the wetmill. Processing: During harvesting season, the farmers deliver cherries to the factory where they are hand sorted for unripes and overripes. A disc pulping machine then removes the skin and pulp and the coffees are graded by density in to 3 grades by the pulper. Grade 1 and 2 go separately to fermentation. Grade 3 is considered low grade and is usually sold to the local market. The coffee is then fermented for 16-24 hours under closed shade. After fermentation the coffees are washed and again graded by density in washing channels and are then soaked under clean water for 16-18 hours. Drying is done on African dry beds for 7-15 days and the coffees are covered in plastic during midday and at night.